After sinking, the RMS Titanic lay undisturbed beneath 12,000 feet of freezing North Atlantic water for years, but in 1985 its watery tomb was finally breached by another marquee vessel—the crown prince of HOVs. Alvin is a manned deep-sea research vessel named after Allyn Vine, an oceanographer instrumental to modern deep-ocean research. The vessel is owned by the US Navy but operated by the Woods Hole Oceanographic Institution (WHOI). Built in a GE plant that normally churned out heavy equipment used for making breakfast cereal, Alvin entered service in 1964. It has since completed more than 4,400 dives and generated enough data for almost 2,000 scientific papers. Alvin measures 23-feet long, nearly 12 feet tall, and weighs 17 tons. The HOV moves using five thrusters powered by a series of lead-acid batteries and has a range of six nautical miles and a top speed of two knots. Its personnel sphere is made of two-inch thick titanium, has an outside diameter of nearly seven feet, and can carry three crew members—two researchers and a pilot—for up to 216 man-hours, though dives generally only last six to ten hours. If Alvin were to sink with crew on-board, the vessel is designed to split in half and allow the personnel sphere to rise to the surface. Problem is—the sphere rockets to the surface like a ping-pong ball from the bottom of a pool which likely causes an ungodly case of the bends and kill anyone aboard. This escape method has not yet been tested by WHOI, likely due to a lack of volunteers. Alvin is packed to the gills with recording instruments. In addition to the standard fare of navigation equipment, video and still imaging, temperature probes, sampling systems, and magnetometers, the ship is equipped with quartz iodide, sodium-scandium, thallium iodide, and metal halide lights to illuminate the inky blackness of the ocean floor. It also can grapple using dual hydraulic manipulators mounted on the bow of the submersible with a 75-inch reach and strong enough to lift 250 pounds apiece. 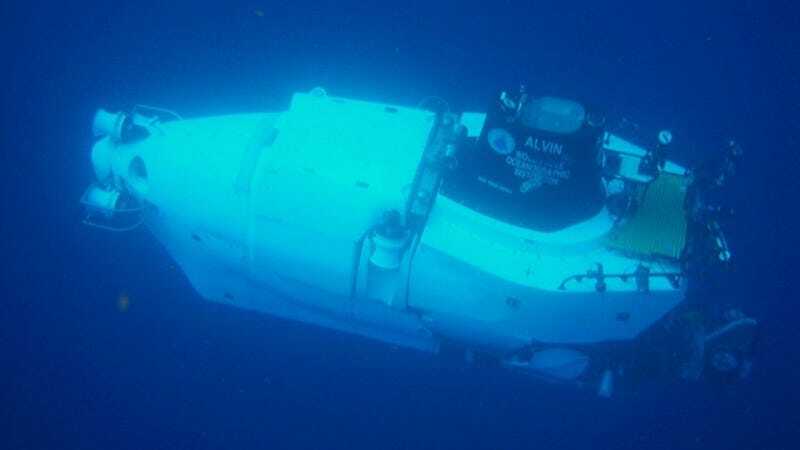 During its decades of service to the National Oceanic and Atmospheric Administration (NOAA) Alvin helped study the first known black smokers—hydrothermal vents—and, most famously, for making the first successful dive of the RMS Titanic since it went down. In 1986, Alvin carried Dr. Robert Ballard and two others 12,000 feet below the Atlantic for a detailed study of the wreck. With help from a companion ROV, Alvin's crew produced a detailed photographic survey of the site.